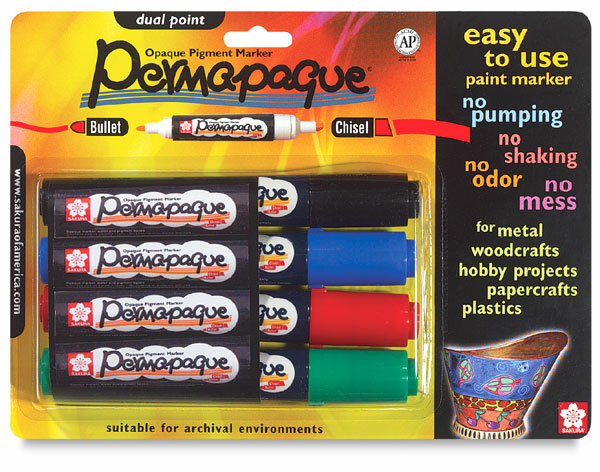 Permapaque markers are safe, no-mess opaque paint markers that you do not need to shake. They are non-toxic, quick drying, odorless, permanent, and suitable for acid-free environments. Not permanent on non-porous surfaces. Use them on almost any surface, including ceramics, wood, metal, and glass. Available in Dual Point or Fine Point. Each Dual Point marker has a chisel point at one end for both detail and a wider coverage, and a bullet point at the other end. Set of 4 Dual Point Markers — This set contains one dual point marker in each of 4 colors, including Black, Blue, Green, and Red. Set of 16 Fine Point Markers — This set contains one fine point marker in each of 16 colors, including Black, Red, Purple, Green, Blue, Orange, White, Pink, Yellow-Green, Sky Blue, Metallic Gold, Metallic Silver, Metallic Bronze, Metallic Pink, Metallic Purple, and Metallic Blue.